Cholesterol-lowering foods should be incorporated into everyone's diet for optimal health. Different diets, lifestyles, and foods will work differently for different people. It is recommended that you buy a Cholesterol Test Kit, so you can monitor your cholesterol levels at home and see which diet and lifestyle work best for you. Cholesterol-lowering foods include oat bran, flax seeds, garlic, almonds, walnuts, whole barley, and green tea. Below is a detailed list of foods which lower bad LDL cholesterol, while leaving the good HDL cholesterol largely unaffected. Bran, particularly oat bran, has been proven effective in lowering LDL cholesterol levels. (4, 5) Add bran to hot cereals and bread. Also, eating whole oatmeal every morning, or switching to whole products like brown rice, can help you get more bran in your diet and lower your cholesterol. Click to see complete nutrition facts for Oat Bran. Up to 50 grams of flax seeds a day has been shown to reduce LDL cholesterol in healthy young adults by up to 8%, (6) and 38 grams of flax seeds per day reduced LDL cholesterol by 14% in people with high cholesterol (hypercholesterolemia). (7) In both studies, the flax seeds were consumed in a muffin or other bread product. Flax seeds are easily incorporated in baked goods, as well as added to hot cereals like oatmeal. Click to see complete nutrition facts for Flax Seeds. Studies show that less than half a clove (900mg) of raw garlic a day can lower cholesterol by 9-12%. (8,9) Raw garlic is best and can be added to olive oil salad dressings, or as a garnish on soups and sandwiches. Click to see complete nutrition facts for Raw Garlic. Several studies report that eating up to half a cup of almonds can reduce cholesterol levels by up to 10%. (10,11) In a dose-response study, it was found that a quarter cup of almonds reduces cholesterol by 5% and half a cup causes the full 10% reduction. (11) As almonds are a high calorie food,it is not recommended that you eat more than half a cup. Almonds are great as a snack, or as an addition to breakfast cereals like oatmeal. Click to see complete nutrition facts for Almonds. Lycopene is a carotenoid pigment responsible for giving fruits and vegetables their red color and is found in tomatoes, watermelon, and various other high lycopene foods. Studies are conflicting as to whether lycopene reduces LDL cholesterol or not. Some studies report a 10-17% reduction (12,13) while other studies find no difference. (14) Despite this difference, lycopene is thought to generally promote heart health whether it lowers LDL cholesterol or not. Click to see complete nutrition facts for Walnuts and Pistachios. Like the bran from oats and rice, barley reduces cholesterol, particularly when it is used as a substitute for wheat products. (19) Barley can easily substitute for wheat in the form of barley noodles, barley flour, or whole pearl barley. 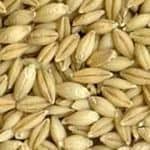 Click to see complete nutrition facts for Barley. The plant sterols and cocoa flavanols in dark non-milk chocolate reduce cholesterol by 2-5%. (20) Further, plant sterols (phytosterols), found in all plants, and particularly plant oils like corn oil and soybean oil have been shown to lower LDL cholesterol by up to 16%. (21) However, this reduction is largely due to inhibiting absorption of cholesterol, and would not have a large effect if you consumed little or no cholesterol. Click to see complete nutrition facts for Dark Chocolate. Green tea has long been a staple in East Asia where it is believed to wash oil (fat) out of the body. Studies suggest this may be true as green tea can lower cholesterol by 2-5%. (22) Green tea without sugar also has few calories (typically less than 10) and can make a great substitute for a variety of beverages. Click to see complete nutrition facts for Green Tea. Take Niacin (Vitamin B3) Supplements - Niacin has been shown to lower LDL (bad) cholesterol and raise the level of HDL (good) cholesterol. (23) The degree to which it lowers LDL cholesterol has not been measured, but one study reports a 20% increase in HDL (good) cholesterol. (24) There are no studies on the effect of high niacin foods as compared to the supplement. However, it is commonly construed that eating high niacin foods will help lower bad LDL levels while raising good HDL levels. Lose Weight - Losing weight, particularly belly fat, will help lower LDL cholesterol levels, and will certainly help prevent type II diabetes, a big risk factor for cardiovascular disease. (28,29) Check your Body Mass Index (BMI) and aim for a BMI between 20-22. Become Vegan - Being vegan involves eating only plant foods and avoiding all animal foods such as dairy, meats, seafoods, etc...Veganism has been shown to lower cholesterol numbers as well as triglyceride levels. (30) This is especially true for vegan diets that do not contain refined sugars, processed foods, or trans-fats, and consist mostly of high fiber foods like beans, nuts, whole grains, fruits, and vegetables. Reduce Stress - Studies show that mental, emotional, or psychological stress can increase cholesterol levels by 10%. (30,31,32) One study, in particular, found that college students have high cholesterol levels before tests than other times in the semester. (32) Another study found that performing a stressful mental activity, like math, increases cholesterol levels. (33) To reduce stress in your life try drinking hot tea, yoga, or spending time with friends. Try new things till you find something that works for you. Mensink RP, Katan MB. Effect of a diet enriched with monounsaturated or polyunsaturated fatty acids on levels of low-density and high-density lipoprotein cholesterol in healthy women and men. N Engl J Med. 1989 Aug 17;321(7):436-41. SC Cunnane, MJ Hamadeh, AC Liede, LU Thompson, TM Wolever and DJ Jenkins. Nutritional attributes of traditional flaxseed in healthy young adults. American Journal of Clinical Nutrition, Vol 61, 62-68, 1995. Bahram H Arjmandi, Dilshad A Khan, Shanil Juma, Melinda L. Drum, Sreevidya Venkatesh, Eugenia Sohn, Lili Wei, and Richard Derman. Whole flaxseed consumption lowers serum LDL-cholesterol and lipoprotein(a) concentrations in postmenopausal women. Stephen Warshafsky, Russell S. Kamer, Steven L. Sivak. Effect of Garlic on Total Serum Cholesterol A Meta Analysis. Annals of Internal Medicine, 2004. Abbey M., Noakes M., Belling G.B., Nestel, P. Partial replacement of saturated fatty acids with almonds or walnuts lowers total plasma cholesterol and low-density-lipoprotein cholesterol. The American Journal of Clinical Nutrition, 1994;59:995-9. Dose Response of Almonds on Coronary Heart Disease Risk Factors: Blood Lipids, Oxidized Low-Density Lipoproteins, Lipoprotein(a), Homocysteine, and Pulmonary Nitric Oxide. The American Heart Association, 2002;106:1327. No Significant Effects of Lutein, Lycopene or Beta-Carotene Supplementation on Biological Markers of Oxidative Stress and LDL Oxidizability in Healthy Adult Subjects. J Am Coll Nutr June 2001 vol. 20 no. 3 232-238. Effects of walnuts on serum lipid levels and blood pressure in normal men. N Engl J Med. 1993 Mar 4;328(9):603-7. Barley and wheat foods: influence on plasma cholesterol concentrations in hypercholesterolemic men. Am J Clin Nutr May 1991 vol. 53 no. 5 1205-1209. Green tea consumption and serum lipids and lipoproteins in a population of healthy workers in Japan. Ann Epidemiol. 2002 Apr;12(3):157-65. A Double-Blind, Placebo-Controlled Study of Extended-Release Niacin on Atherosclerosis Progression in Secondary Prevention Patients Treated With Statins. American Heart Association Journal. Circulation.2004; 110: 3512-3517 Published online before print November 10, 2004, doi: 10.1161/?01.CIR.0000148955.19792.8D. Effects of Endurance Exercise Training on Plasma HDL Cholesterol Levels Depend on Levels of Triglycerides. American Heart Association Arteriosclerosis, Thrombosis, and Vascular Biology. Effects of Diet and Exercise in Men and Postmenopausal Women with Low Levels of HDL Cholesterol and High Levels of LDL Cholesterol. N Engl J Med 1998; 339:12-20July 2, 1998. Cholesterol lowering effect of dietary weight loss and orlistat treatment--efficacy and limitations. Aliment Pharmacol Ther. 2004 Jun 1;19(11):1173-9. Weight loss improves lipoprotein lipid profiles in patients with hypercholesterolemia. J Lab Clin Med. 1985 Oct;106(4):447-54. Diet and serum lipids in vegan vegetarians: a model for risk reduction. J Am Diet Assoc. 1991 Apr;91(4):447-53. Further studies on cholesterol levels in the Johns Hopkins medical students: The effect of stress at examinations. From the Department of Medicine, The Johns Hopkins University School of Medicine, Baltimore, Md. USA Received 5 September 1958. Available online 23 March 2004. Acute Cholesterol Responses to Mental Stress and Change in Posture. Arch Intern Med. 1992;152(4):775-780.